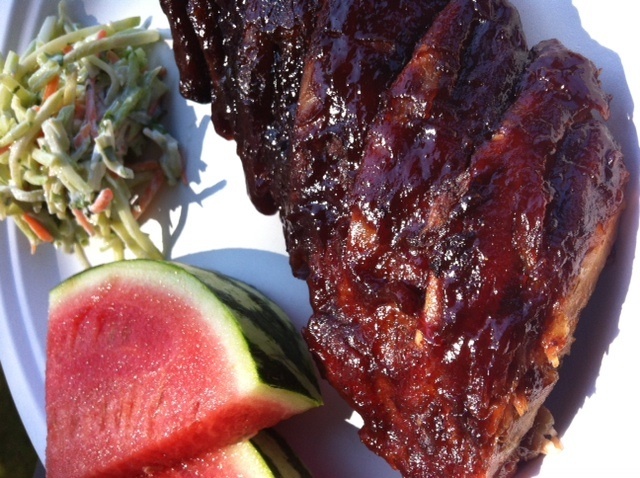 Memorial Day weekend means, My Secret Rib Recipe! The recipe below is mostly mine, the technique, all Sunset Magazine. The ribs basically “steam” in the foil to make it taste like it’s taken all day. (Gotta love that!) I prepare the ribs ahead of time by rubbing them in the dry rub, and leaving them in the fridge for as little as 2 hours and up to two days. ENJOY! Season ribs with the dry rub and leave it on the ribs for at least two hours and up to two days. Cover ribs with aluminum foil. Heat the gas grill on High for 10 mins, turn center burners off, and outside burners to Medium. Lay foil wrapped ribs on the grill (middle where the burners are off, so using in-direct heat), convex (meat side up), overlap slightly if necessary. Cover grill and cook till tender when pierced through foil and everything. (1-1 1/4 hours). Remove foil, brush tops (meat side) with barbecue sauce, turn over and cook until sauce has browned (10 mins. ), brush concave (bone side), and turn again, and cook until browned (10 mins.). Cover and transfer to a cutting board.